Santa Catarina`s coast is one of the most beautiful in Brazil. The Sun Route is a full showcase of the coasts most expressive beauties: beaches of white sand and crystal-clear waters, surrounded by verdant hills; lively seaside resorts with exciting night life and bucolic spots, some of which are practically wild; sheltered coves and open sea beaches. Natural beauty, lots of beaches, various options for leisure and good infrastructure determine tourism as the main economic activity of the Sun Route--but not the only one. Itajaí, the region’s economic center, is a port city. Besides having an impressive turnover of containers, it is Brazil’s largest fishing terminal and the only one in the South that is equipped with an exclusive pier for mooring transatlantic liners. 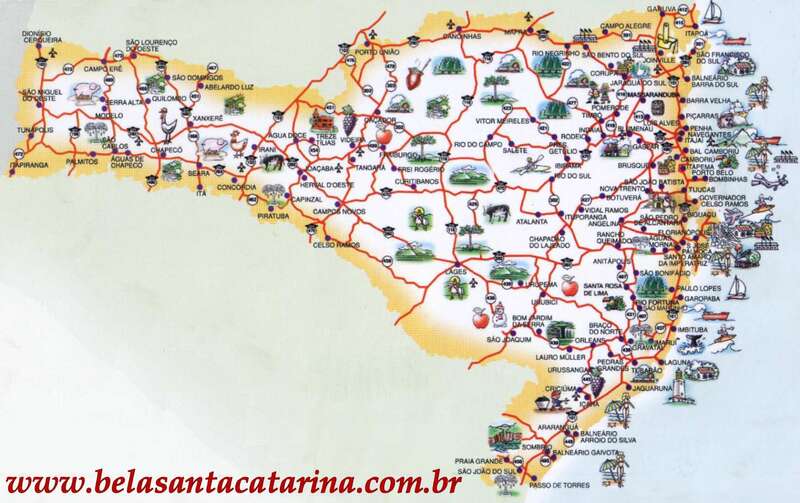 Also here is Balneário Camboriú, greatest magnet for of Santa Catarina’s tourist activity during summer time, and the cities that make up the Emerald Coast—Itapema, Porto Belo, and Bombinhas. A privileged location is also a major appeal of the Sun Route. The cities that belong to this circuit are very near one another, and close to cities that incorporate other tourist itineraries of the State; Blumenau, Brusque, and Nova Trento, as well as the cities of the European Valley, are half an hour’s drive from Itajaí. The capital, Florianópolis, is just one hour away. Beaches both calm and busy, good restaurants, night clubs and diversified activities make of Balneário Camboriú one of the favorite Brazilian destinations for vacationers—the city welcomes around 1 million tourists in the high season. Riding the cablecar at Unipraias Park, which is located between Central Beach and Laranjeiras, offers a privileged, panoramic view of the city, the bay, the river, the Atlantic Forest. Interpraias Highway, connecting the city with Itapema, provides easy access to the beautiful beaches and offers a dazzling scenery. Pinho Beach is located here, the country’s first official nudism beach. The emerald-green tone of the sea between Itapema, Porto Belo, and Bombinhas has named this stretch of carved peninsulas, sheltered coves, with over 30 gorgeous beaches, crystal-clear sea with great visibility for underwater diving—divers from all over Brazil seek the region due to its proximity to the Arvoredo Biological Marine Reservation. The fishing villages reveal influences from the Azorean culture, which can be seen in the seafood-based cooking, in folklore and in the colonial architecture. On the Island of Porto Belo, there are ancient inscriptions on rocks; one can also go on guided tours of the Atlantic Forest and enjoy a panoramic restaurant. Itajaí is a modern, progressive city. But it has managed to preserve the kind of charm that only port cities seem to have. Besides the beautiful beaches, there is a valuable, well-preserved historical heritage, with a mixture of Portuguese and German traits. The cities of Navegantes, Penha, and Piçarras are located North of Itajaí. The international airport which serves the entire region is at Navegantes. Besides having beautiful beaches and plenty of Azorean culture, Penha is home to Beto Carrero World, the largest theme park in the world. Balneário Piçarras offers good structure for nautical sports, well-preserved nature and intense night life.